In the Syfy original series "Dark Matter," six people wake up on a spaceship with no memory of who they are. Jodelle Ferland plays "Five." Syfy's space-based TV series "Dark Matter" wraps up its first season tonight (Aug. 28) with back-to-back episodes and a jaw-dropping revelation that even the cast didn't see coming. "Dark Matter" is the story of six people who wake up on a derelict spaceship with no idea who they are or how they got there. As the group members slowly discover clues about their past, they face struggles of identity and redemption. In the second-to-last episode of the season, former "Star Trek: The Next Generation" cast member Wil Wheaton guest stars as a delightfully evil villain. During the season finale, hard-won alliances begin to unravel as it becomes clear that the crew is being betrayed. The last moments of the finale contain a dramatic revelation that even the show's cast called "shocking," during a press call held earlier this week. 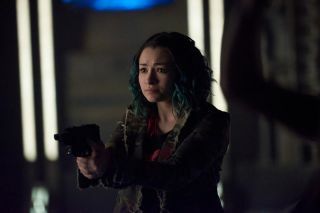 Four of the seven central cast members of "Dark Matter" told members of the press that they didn't know how the series would end until the very last day of shooting. Throughout filming, the cast said they had theories as to how the season would end but were still blown away by the final reveal. It was the show's creator, executive producer and showrunner Joe Mallozzi, who decided to keep it hidden. However, Mallozzi said during the call that he did leave hints throughout the show about what would happen. Wil Wheaton guest stars as an evil villain in the second-to-last episode of the Syfy original series "Dark Matter." Mallozzi spoke with Space.com earlier this year about some of the exciting science fiction concepts featured in "Dark Matter," including faster-than-light travel by clone. He said on the press call that, while the first season of the show was focused mainly on developing the characters, if it gets picked up for a second season, he would like to focus on more world-building. Mallozzi also wrote the graphic novel that the show is based on, and is a veteran science fiction television writer who, among other credits, was heavily involved in the "Stargate" franchise. Syfy also debuted the original science fiction show "Killjoys" earlier this year. That show wrapped up on Aug. 15. Select episodes of both shows are available to watch free on the Syfy network website.